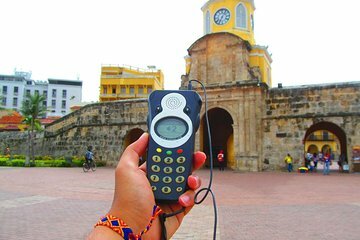 See the city of Cartagena through the eyes of iconic Nobel Prize-winning Colombian author Gabriel Garcia Marquez with this 3-hour independent audio tour. Learn about the work of “Gabo,” a renowned author whose work seamlessly blended reality and fiction, exploring this colonial city’s many mysteries through his own words and characters. The audio content lasts for approximately 3 hours and includes 35 unique ‘stations’ that match different stories within the city. It's a fun, unique way to explore this charming city through the eyes (and pen) of one of the world's most famous novelists. We booked a walking tour with a taped guide. When meeting up with Gabriel our guide I became concerned that between wearing earphones, carrying the tape recorder and a water bottle we were a sitting duck for pick pockets since we look so much like the average ugly tourist. Gabriel offered to walk us through, which worked GREAT. If you enjoy Garcia Marquez, this self-guided tour is excellent. It takes you to places relevant to his years in Cartagena, and - the best part - places that appeared in Love in the Time of Cholera, and Of Love and Other Demons. The tour takes about 3 hours, but you can do it at your own pace. The woman from Tierra Magna was very helpful, even delivered the materials to the hotel. You get a map and an audio guide. This was very cool because you had the freedom to roam and listen to the history of Gabo's experience in Cartagena. I would have preferred if they had an option of someone to show you around and explain it themselves or guide you where to be and let you listen and be there to answer any questions especially if you speak Spanish as well. It was nice though. I learned alot about Gabriel Garcia Marquez that I never knew and it did make me appreciate Cartagena more and view it in a different light and admiration. because I was slow walking, I could have used more time. I walked and gawked there was so much beauty and sights to take in. It was indeed a magical place.